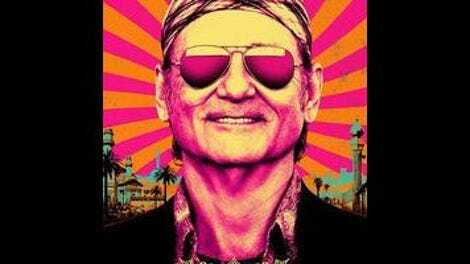 All of which makes Murray the perfect star for Barry Levinson’s vaguely-based-on-a-true-story would-be uplift movie Rock The Kasbah, a comedy that’s openly afraid to seem too sincere or too mawkish, and doesn’t fully commit either to its comedy or its uplift. Like Murray, it’s wry and presented largely in air quotes, with an accompanying eye-roll. Screenwriter Mitch Glazer (who also scripted Scrooged) was inspired by the story of Setara Hussainzada, a Muslim woman who defied the ultra-conservative post-Taliban culture in Afghanistan by singing and dancing on the American Idol equivalent Afghan Star in 2008. In an era following shortly after a complete ban on music or dancing—let alone women entertaining on television—Hussainzada dealt with death threats, extensive personal harassment, and widespread condemnation, as documented in the Sundance-award-winning documentary Afghan Star and its much more intimate follow-up, Silencing The Song. Given such an outspoken, humorous, iconoclastic real-life character, Glazer finds the least interesting possible angle on her story: the question of how her bravery affects a down-on-his-luck American scam artist who hopes to ride her burka-train to glory. Murray plays scammy Van Nuys talent agent Richie Lanz, a divorced deadbeat dad who’s reduced to working out of a low-rent hotel and cheating talentless wannabes for pocket cash. Not that any of this stops him from making up stories of how he discovered Madonna, or urged Stevie Nicks onstage when no one else could. A drunken encounter with a USO booker prompts Richie to take his gal-Friday singer Ronnie (Zooey Deschanel) to Afghanistan on tour: “We’re at war, dude!” the booker crows, when asked whether it’s a lucrative job. “The faucet is open!” But circumstances leave Richie stranded, broke, and without a passport, so he takes on an odd job for a couple of yo-bro ammo merchants (Danny McBride and Scott Caan), which leads him to a remote Pashtun village where a woman named Salima (Leem Lubany) watches Afghan Star and sings to herself in a cave. Naturally, he thinks he’s found his new meal ticket. But mostly, the problem with Rock The Kasbah is that it doesn’t have any sort of consistent idea or ethos, even a consistent goal as minor as “be funny” or “be moving.” It pours on the treacle when Richie deals with his shockingly young daughter, and manages real emotion during the Afghan Star performance scenes, but otherwise, it tends to undercut its would-be serious moments with deadpan gags. Levinson was successfully light and scathing at the same time with Wag The Dog, thanks to a David Mamet script, but his other attempts at topical, timely comedies, like An Everlasting Piece and Man Of The Year, have fallen much flatter. In this case, it’s more the script than the direction: The film’s idea of ultimate hilarity is the craggy, weary-looking Murray in a blonde wig, lipstick, and diaper, tied to a bed. This is a movie about people who believe in their causes—political, cultural, and artistic—enough to kill or die for them, as channeled through a guy who mostly cares about convincing a Blackwater-style mercenary (played with a squint and a shrug by Bruce Willis) that he once dated Danielle Steel. It’s Ishtar with the passion and sincerity replaced with a surface-level shrug.